In regard to Apple Day, what started out as a protest against imported produce evolved into a celebration of local fare. Back in 1987 there was a ban in Sweden on many varieties of imported produce during the peak Swedish growing season and that ban included apples. During the fall of that year, the “Apple War” became a hot topic in the mass media with discussions about pesticides and poison control on imported products. As the U.S. and EU tried to break down the barrier of the ban, Swedish farmers protested vehemently fearing for their livelihood and Swedish farming with the introduction of cheaper produce farmed with pesticides that were banned in Sweden. The seasonal produce ban was to be lifted in 1988 so the Swedish professional fruit grower’s association applied for and received various grants to launch a year-long, mass media campaign to heighten consumer awareness about the quality of Swedish produce which had essentially gone unadvertised to date. 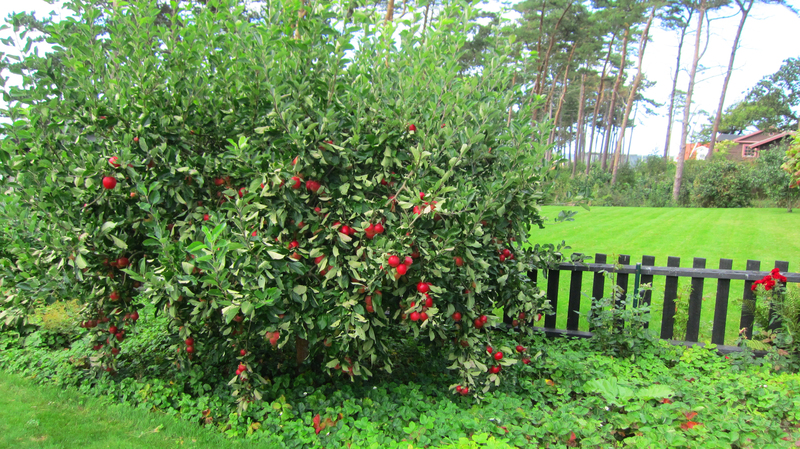 During September/October, the focus of the campaign was “Svenska Äpplen 1988” or “Swedish Apples 1988.” Kurt Lundholm, the former Secretary of the Swedish grower’s association had the idea to pair the campaign with an apple market celebration in Kivik, a significant orchard area along the southeastern coast. The first apple market was held on October 16, 1988 and despite the reportedly bad weather, 6,000 people came to buy fresh produce from the orchards, see the exhibitions, and a newly produced film about Swedish fruit was presented. Today, the apple market in Kivik continues and regularly draws over 20,000 visitors over the weekend celebration. One of the highlights is an artwork created from apples. Aside from sharing the history of Apple Day in Sweden, I want to share one of my favorite recipes from my mother-in-law, her apple chutney. Back in the 1970s, my in-laws (and future husband who was then 8 years old) moved to Zambia while my father-in-law, who was a structural engineer, worked on building a rural hospital at a mission station. While in Zambia, my mother-in-law started making mango chutney. After four years, they moved back to Sweden where mangoes are certainly not commonplace, so she began making the chutney with apples from her trees instead. She currently has an incredible apple tree in her yard (pictured above) and I always look forward to when the apples are ready. 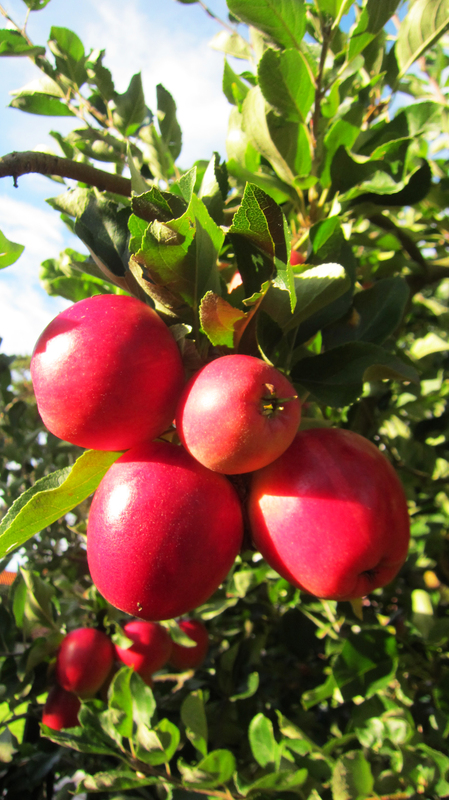 This amazing tree seems to have masses of worm-free apples every year. I can no longer eat grilled meat in Sweden without craving this chutney as an accompaniment. It takes a bit of time to make with all of the chopping and peeling, but is well worth the effort. Plus, the chutney you make this fall will get you through the seasonal fall and winter roasted meats, and perhaps even through the entirety of next summer’s grilling season until the next Apple Day. Combine all of the ingredients in a large, non-reactive pot (such as stainless steel or glazed enamel). Bring to a boil and simmer 1 hour covered, stirring occasionally. Uncover and simmer 1 additional hour or until thick, stirring occasionally. Put in sterilized jars and keep refrigerated for up to one year. *If in Sweden, you can use 1 1/2 cups ättiksprit (12%) and 4 1/2 cups water in place of the water and cider vinegar listed above. And one of our favorite treats when we were little…my mom would slice crisp apples in wedges, stick them with toothpicks, and float them in a bowl of salted water with ice cubes. We loved it. Add 2- 3 teaspoons of salt to 4 cups (500ml) of water and stir to dissolve. Add the apple wedges, ice cubes, and enjoy. Lovely! Nice little lesson. 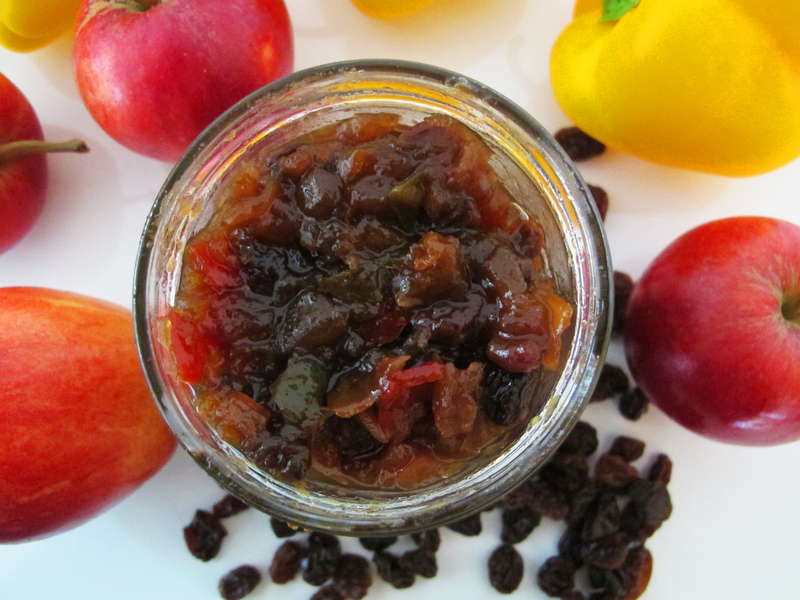 Isn’t apple chutney simply delicious?! Wow, I had no Idea about Apple day! Interesting! Since about a month ago I’ve been asking my husband if we can go Apple picking (something I enjoyed doing in NY) and he said it is not so popular in Sweden except in the very south where the only orchids are. I’ve noticed many people have their own apple trees, so I guess need isn’t so high! That recipe looks great! I remember apple picking was a big deal in New England, but we never went during the 8 years we were in Boston. Kind of a shame, really. I am just so excited to be able to pick the apples at my mother-in-law’s. They are always so good and it’s so fun to just walk out the door and pick them. I have aspirations to one day have a tree of my own, but that will also require a yard. Baby steps! Awesome!!! I’ve been wanting to make some homemade chutney!!! Yum!! !